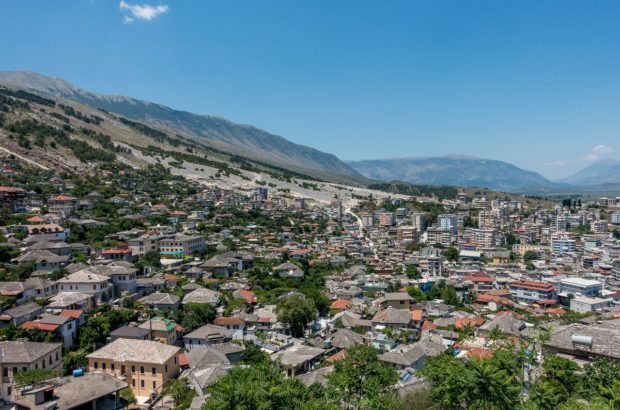 When we decided to travel to Albania, we had absolutely no idea what to expect. We’d heard a few sound bites about bad roads and transportation challenges and a few vague assertions that it was an inexpensive place to visit – nothing to help us form any good ideas about what we would be experiencing. For us, as for most Americans, Albania was a completely dark place on our mental maps. 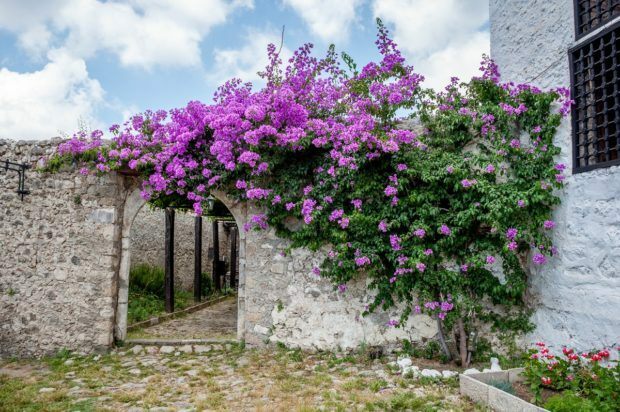 What we found in Albania was a mix of remarkable natural beauty, deep history, tempting food, and some of the nicest people you’ll meet anywhere. It’s like Italy with limited public transportation and the French Riviera with more partially-constructed buildings and less attitude. Albania is like its neighbor to the south, Greece, but with far fewer tourists and a whole lot of Cold War bunkers. In a lot of ways, it’s probably like other parts of Europe were 30 or 40 years ago, which gives it a feeling all its own. You won’t find a McDonald’s or Starbucks here. And, yes, it is cheap. And safe. Our week traveling in Albania gave us a chance to scratch the surface of all that this undiscovered country has to offer. In our brief time, we uncovered some of Albania’s highlights. Ksamil is a dream. Turquoise water, fresh seafood, hospitality beyond compare…and all at an absurdly affordable price. This little sea village just an hour from Greece was our favorite discovery on our visit to Albania. Part of the Albanian Riviera, Ksamil echoes some of the best parts of Europe. It has the seas of the South of France, the beaches of the Italian Riviera, and the food of the Mediterranean, minus the people. Most of the coves and small beaches are privately owned, but you can rent a chair and umbrella for about $4 USD a day. 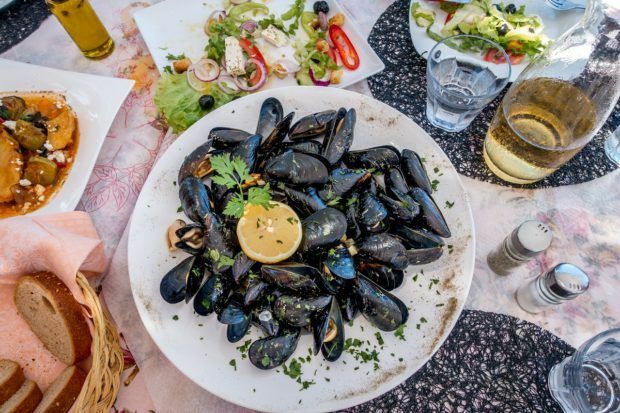 Because a lot of the spots are connected to restaurants and bars, they’re probably just a few steps from amazing fresh fish and even a mojito or two. If lying on the beach all day isn’t your style, you can do what we did and rent a boat to visit the three nearby islands. An hour in the boat – plus a captain to drive us – was only $30. You can also rent wave runners, paddle boats, and all manner of other water equipment. 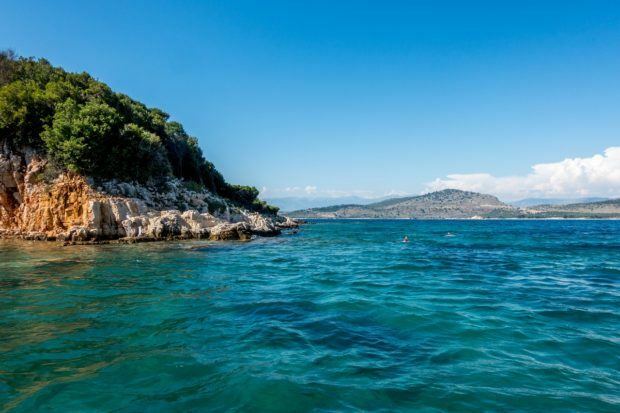 We hear that it can get busy in Ksamil during the summer season, which is roughly mid-July through August, but in early July, there was just a handful of people taking advantage of the beautiful scenery. We had no idea what to expect when it came to history in Albania. It turns out that some of the history of this little-known country mirrors that of the rest of the region – it’s Greek and Roman. 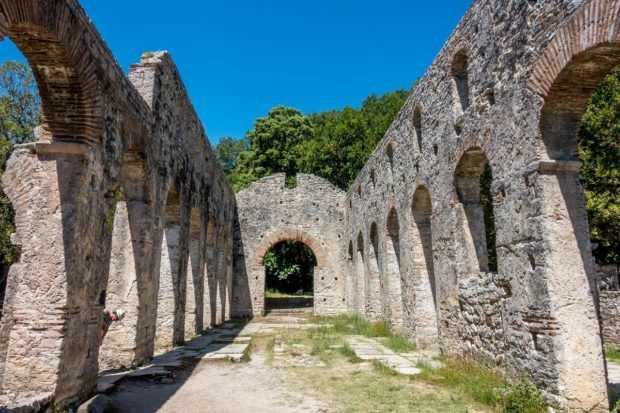 Our first historical stop on our trip to Albania was Butrint, a UNESCO World Heritage Site less than 10 minutes from Ksamil. 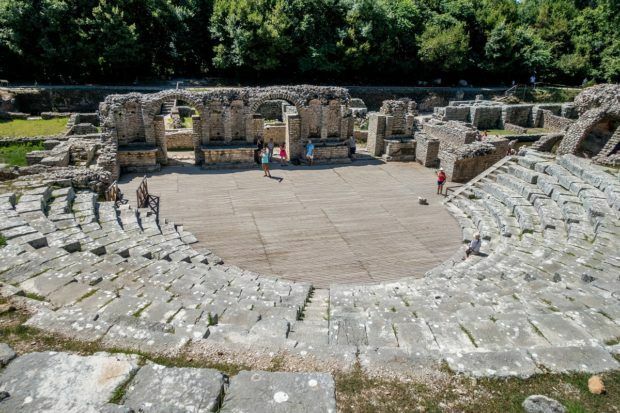 A colony since prehistoric times, Butrint (then known as Buthrotum) was controlled by Greeks until the Romans took over in the 1st century BC. By the 5th century AD, it was an early Christian center. It was then briefly occupied by the Venetians before being abandoned in the Middle Ages. Remarkably, evidence of each civilization is still clear as you walk around the massive site. The most interesting remnant of the Greek era is the well-preserved amphitheater that dates from the 4th century BC and still hosts yearly events. One of the other most recognized features of Butrint is a Greek monument that was adapted by the Christians into a baptistery. Its floor is an intricate mosaic that is only uncovered every few years in order to protect it. We were fortunate that the mosaic had been partially revealed just a few days before our visit. 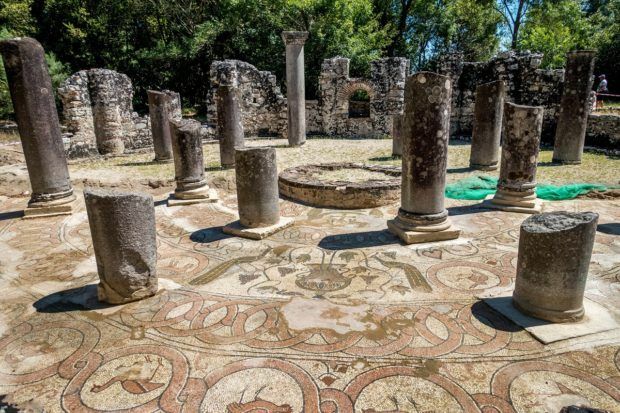 A visit to this ancient site is definitely one of the best things to do in Albania. Another of Albania’s UNESCO World Heritage Sites, the town of Gjirokastra is situated in the Drinos river valley in southern Albania. Wherever you look around the stunning landscape, unique buildings coat the hillsides. From the town’s 13th century castle to its slate-roofed houses, the effect is nothing short of magical, especially at sunset. 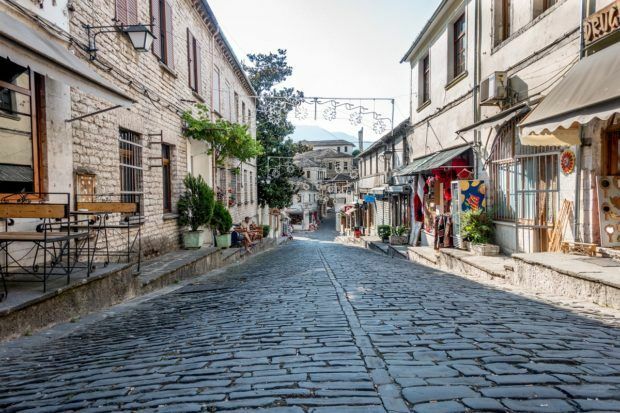 There has been a settlement in Gjirokastra for 2500 years, but it is the town’s 17th-century homes that have put it on UNESCO’s list. The houses from the Ottoman period are designed to look like small castles with stone roofs and whitewashed stone walls. One is now open as an ethnographic museum. 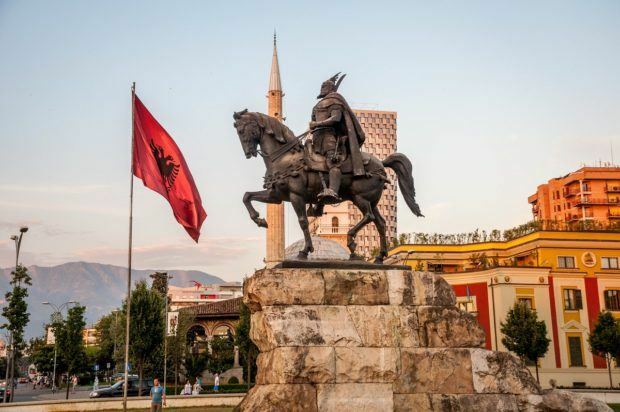 The capital city, Tirana will be on the must-visit list for most people who travel to Albania. 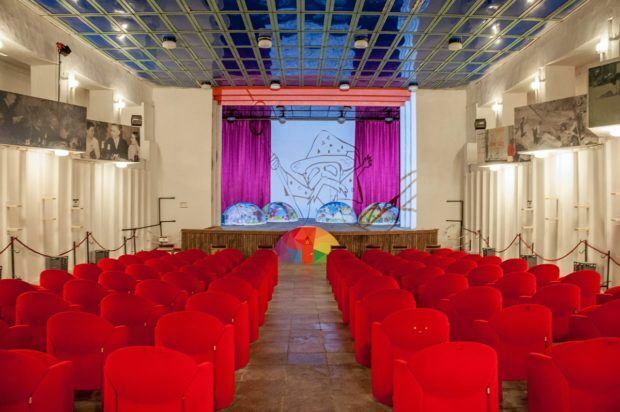 Unlike many European capitals, Tirana is not full of traditional monuments and an overwhelming list of things to see. Instead, it is a vibrant city still finding its footing in post-Communist times. There is an interesting mix of historic and modern sites to see in Tirana. The primary historic sites, which are concentrated near Skanderbeg Square, include the intricate decorations in the 18th century Et’hem Bey Mosque as well as Tirana’s Clock Tower and the National History Museum. On the more modern end of things is the city’s crumbling Pyramid. 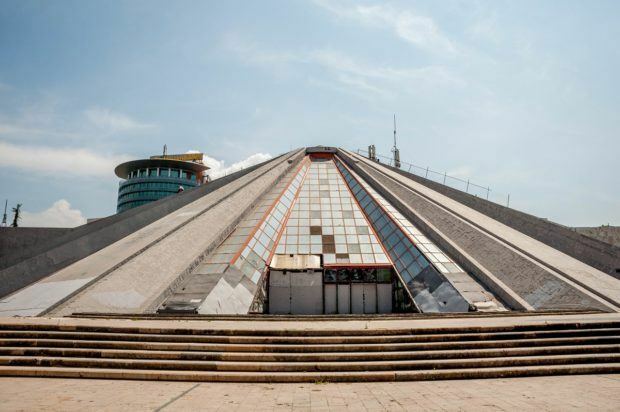 Built as the Enver Hoxha Museum, a monument to Albania’s former Communist leader, the building is now mostly a curiosity for visitors who want to climb to the top of its steep peak. There is also the recently-opened Bunk’art. 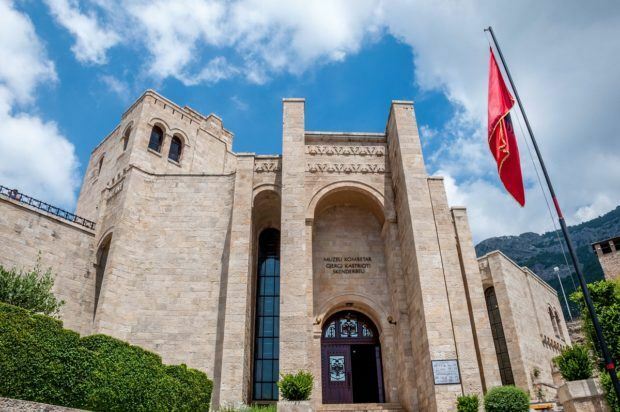 The massive bunker, which was built to house the Albanian government during the Cold War, is now a fascinating exhibit space featuring unique contemporary art as well as artifacts from the Communist period. The most energetic part of Tirana is the Ish-Blloku (ex-Block) neighborhood. Formerly the home of the Communist elites, the neighborhood is now filled with cafes, coffee shops, and cocktail bars. From listening to live music to visiting the rotating bar at Sky Tower, there’s something going on there pretty much every hour of the day. Just 45 minutes outside Tirana, Kruja (Krujë in Albanian) is a small medieval village perched at the foot of Mount Kruja. Its position on the hillside gives it a rustic ambiance and sweeping views of the nearby valley and the Adriatic Sea. In addition to its natural beauty, Kruja also has enormous historical importance in Albania. In the 12th century, it was the capital of the first independent Albanian state. Later, it became the place from which Skanderbeg, Albania’s national hero, defended the country from the invading Ottomans for over 25 years. Kruja Castle is now the Skanderbeg Museum and features exhibits about the sieges. A few steps away, the excellent ethnographic museum shows how people lived in the mid-18th century, long after the Ottomans finally gained a foothold in Albania. But it’s not just about mountainous views and important history in this charming town. 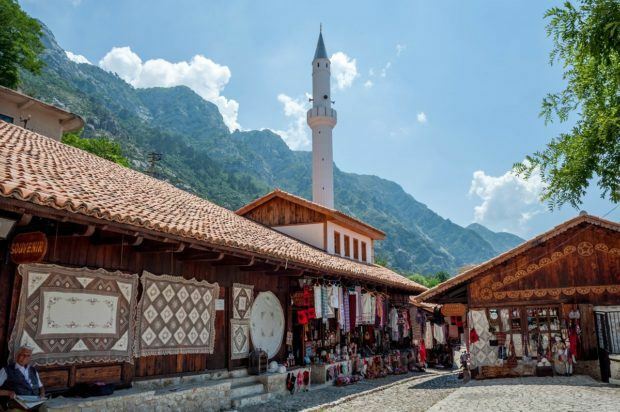 One of tiny Kruja’s central features is its old Ottoman-style bazaar. Down the ancient cobblestone lane, it’s possible to find all manner of souvenirs from coffee mugs to handmade kilims (old style rugs) being weaved on-site. There is also a wide variety of antiques and crafts. 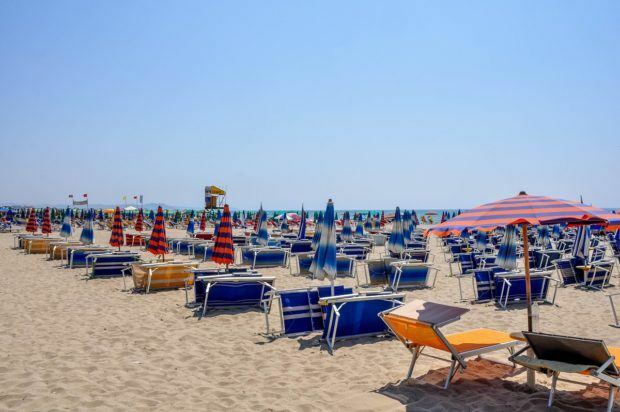 About 30 minutes west of Tirana is Albania’s “first city” — Durres. 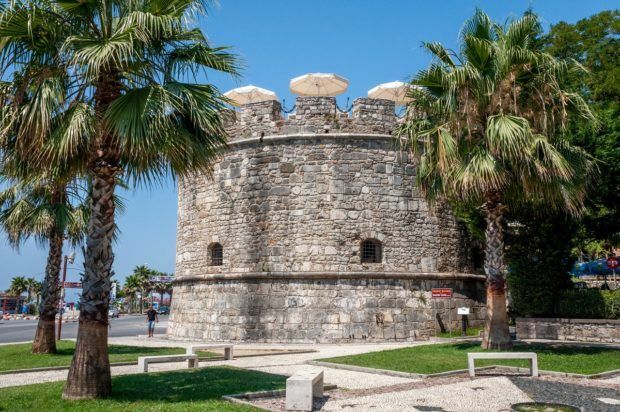 One of Albania’s oldest cities, Durres has a rich, 3,000-year-old history. The strategic location of the city’s port was recognized by early Greeks, Romans, and Venetian explorers throughout antiquity. The compact city center is easy to explore on foot. The Durres amphitheater is one of the largest Roman amphitheaters in the Balkans, accommodating over 20,000 people. The site is a candidate for UNESCO World Heritage Site status, but it is also one of the most endangered cultural sites in Europe because of its crumbling stone work. The buildings surrounding the amphitheater are covered with beautiful murals and street art depicting important events in the town’s history. Nearby, part of the old town wall and fortress still exists. The wall leads down to the port where the Venetian Tower stands guard at the entrance to the city. 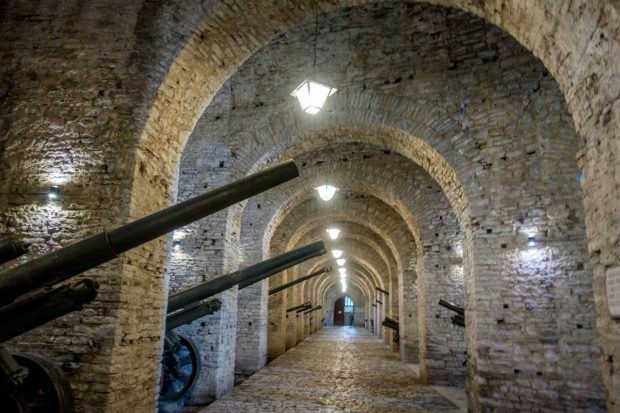 This fortification dates back to the 5th century when it was the anchor of the Durres Castle. Most people coming to Durres head to the broad sandy beaches south of the city. This is where people from Tirana come for the weekend to soak in the sun and cool in the water. The beaches are some of the largest we’ve seen anywhere. We visited Albania as guests of JayWay Travel, specialists in custom tour packages across destinations in Central and Eastern Europe. All opinions of the ancient and beachy are our own. What do you think about Six Unexpected Highlights of a Trip to Albania? Interesting stuff! Thanks for sharing some info about this little-visited place. 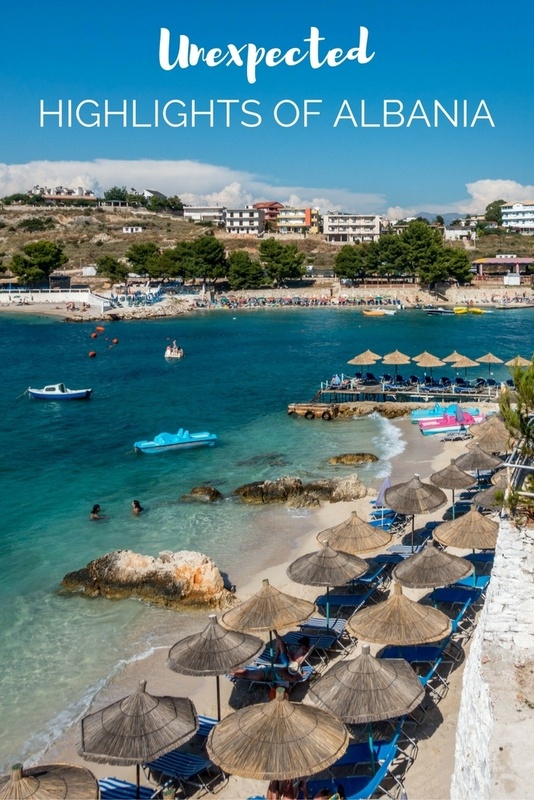 Great round up of the best places to visit in Albania. It really is a hidden gem in Europe and most people said “why would you go there?” when we told them we were visiting. Our answer was “why not?” but now it’s “because Albania is awesome!”. We’ve been telling everyone that will listen that they need to add this beautiful little country to their travel list. Thanks for the interesting info. I am living not to far from Albania, but I’ve never been there. Yup, during our time in Albania, we had a lengthy conversation about the film. Good movie. Even better country.